The Monacelli Press, 9781580933995, 400pp. Explore 100 gardens from around the world with this illustrated guide to the design elements of each—from historical style to planting and landscape design. This comprehensive reference offers gardens from many periods of history—Islamic, Renaissance, English Landscape, Arts & Crafts, and more—and geographically diverse environments—from a nighttime sculpture garden on the Oregon coast, to a sustainable water garden in the mountains of Vermont, and the Mughal garden at the Indian president’s palace in New Delhi. They are inspirational works made by both talented amateurs and major international garden designers—including Britain’s Christopher Bradley Hole, Italy’s Luciano Giubbilei and Paolo Pejrone, and Americans Isabelle Green, Raymond Jungles, and Martha Schwartz. 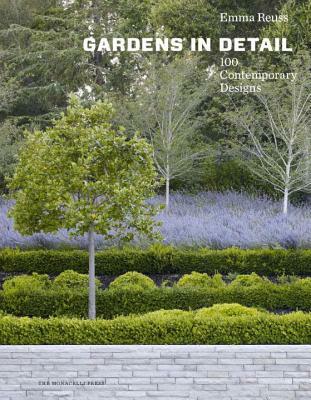 In this affordable volume boasting 500 illustrations, readers are led through the details of each garden and provided with the tools needed to understand and replicate each exemplary design—whether the site is rural or urban, a backyard or a beach, in any climate, and on any budget. Each beautiful project photo is followed by a list of key concepts, numbered close-ups that highlight aspects of the design, and expert write-ups to explain how each element serves the garden as a whole. Whether looking for a whole landscaping scheme, or simply an individual idea for a water feature or a wall, readers will find a wealth of ideas to choose from. Both experienced and armchair gardeners will find that Gardens in Detail will enhance their appreciation of how good design decisions are made at every scale. Emma Reuss is a garden writer and garden designer with a diploma from the Royal Horticultural Society. She has written for Country Life, The Guardian, Saga Magazine, and the Garden Design Journal, and she has contributed to the BBC and Royal Horticultural Society gardening websites. She lives in London, where she cultivates plants and vegetables in her small private garden. "Reaching only for books that feature favorite designers or preferred garden styles broadens neither perspective nor knowledge base. It does a gardener good to see and learn something new—especially when we can do so for a relatively small expenditure of money, time, and effort. In this regard, Gardens in Detail is worth every penny. Gardens in Detail is remarkable for author Emma Reuss’s consistent and highly effective organizational approach. I loved the fact that I could flip through this book’s crisp pages in a spare moment or devote several hours to reading about garden after garden. In each case, I came away with a better understanding of design and a renewed appreciation for the diversity of garden styles throughout the world today." "At more than 400 pages and 3.5 pounds, this tome gives you your money’s worth and then some. Despite its size, however, it never bogs down in technical language or esoteric discussion. Mainly from the U.K. and the U.S. but also, refreshingly, countries as disparate as Iran, Australia, Japan, Brazil, India, France, and China, each garden is showcased across four pages and a half-dozen photographs. Reuss includes gardens from all over the world and writes about them with confidence and an accessibility that makes design less of a mystery. Gardens in Detail is smart without being dense, with just enough detail to give you a sense of each garden and help you understand what makes it captivating." The perfect volume to pick up after a day spent digging in your little backyard and wishing you had the budget and room to think expansively. Reuss has selected 100 outstanding gardens from all over the world. They include every kind of style you can think of from a 15th century Japanese dry sand garden to a walled prairie by Piet Oudolf to an acid green Martha Schwartz creation made of plastic trees and shrubs. She dazzles you with gorgeous photos and then turns practical with detailed deconstructions of the features of each garden. . . . how they were created and why they work. It's informative and fascinating. . . . a liberating armchair travel book as well as a trove of great ideas." "Reuss highlights the full range of gardening styles, themes, and other possibilities in a stunning book that is encyclopedic in scope. She includes, for example, chapters on the garden as art; gardens around the world; urban gardens; and garden composition. The book simultaneously offers intimacy of detail through its 500-plus illustrations and color photos. These, along with the layout and organization, convey a feeling of welcome rather than overwhelming the reader. Creating a garden theme such as French New Baroque seems as much a possibility even for amateur gardeners as does Middle East Contemporary or English Arts & Crafts. All types of gardens are explained and dissected, and Reuss highlights key garden design principles (unity, simplicity, balance, and proportion, among others), giving readers a vantage point from which to see the architecture of the garden and to understand design choices. . . . A valuable resource for any gardener and an essential tool for the landscape designer."